community based activism and awareness actions through a network of Global/Regional Chapters, Project Teams, Annual Events, Media and Charity Work. It was founded by Peter Joseph in 2008 after a call-to-action at the end of the Zeitgeist: Addendum film. The San Diego chapter launched the following year in October 2009. The Movement’s principal focus includes the recognition that the majority of the social problems which plague the human species at this time are not the sole result of some institutional corruption, scarcity, a political policy, a flaw of “human nature” or other commonly held assumptions of causality. Rather, The Movement recognizes that issues such as poverty, corruption, collapse, homelessness, war, starvation and the like appear to be “Symptoms” born out of an outdated social structure. While intermediate Reform steps and temporal Community Support are of interest to The Movement, the defining goal here is the installation of a new socioeconomic model based upon technically responsible Resource Management, Allocation and Distribution through what would be considered The Scientific Method of reasoning problems and finding optimized solutions. This “Natural Law/Resource-Based Economy” is about taking a direct technical approach to social management as opposed to a Monetary or even Political one. It is about updating the workings of society to the most advanced and proven methods Science has to offer, leaving behind the damaging consequences and limiting inhibitions which are generated by our current system of monetary exchange, profits, corporations and other structural and motivational components. The range of The Movement’s Activism & Awareness Campaigns extend from short to long-term, with the model based explicitly on Non-Violent methods of communication. The long-term view, which is the transition into a new social system, is a constant pursuit and expression, as stated before. However, in the path to get there, The Movement also recognizes the need for transitional Reform techniques, along with direct Community Support. For instance, while “Monetary Reform” itself is not an end solution proposed by The Movement, the merit of such legislative approaches are still considered valid in the context of transition and temporal integrity. Likewise, while food and clothes drives and other supportive projects to help those in need today are also not considered a long-term solution, it is still considered valid in the context of helping others in a time of need, while also drawing awareness to the principle goal. 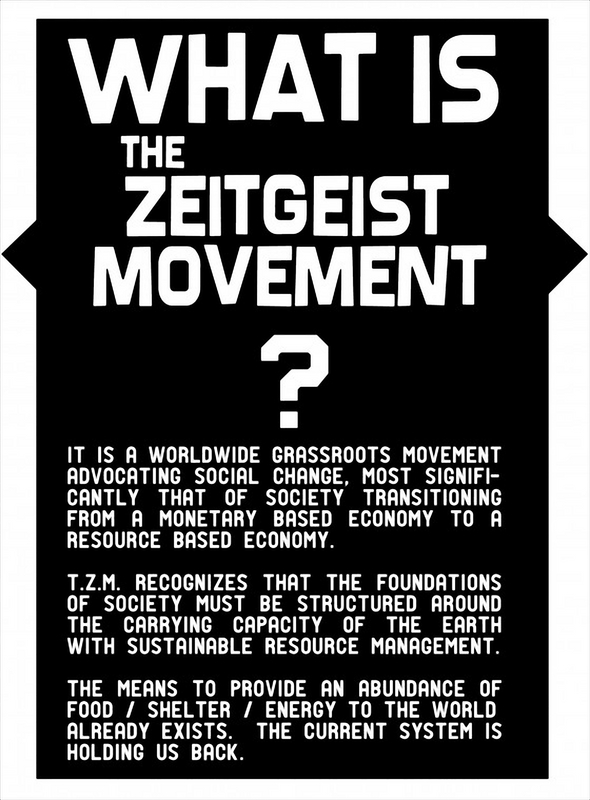 TZM published a book, The Zeitgeist Movement Defined: Realizing A New Train Of Thought. It is the official representative text of The Zeitgeist Movement. The films inspired the movement.